in the Northeast and West. Winter has certainly made its presence known across the country—often accompanied by substantial snow in Eastern and Western mountain ranges. For many, the next few months are a great time to hit the slopes with a pair of skis or a snowboard, all the more so with Winter Olympians’ skill and daring fresh on our minds. Skiing has been popular in the United States since the early 20th century, brought to this country by travelers who had visited, and admired, Europe’s famous Alpine ski centers. Recalling trips to Klosters and Zermatt, Switzerland; St. Anton, Austria; and Chamonix, France—host to the first Winter Olympics in 1924—Americans sought out similar experiences in North America. One person who saw the potential for developing winter sports infrastructure in the U.S. was Averell Harriman, a banker and chair of the Union Pacific Railroad (UP) who in 1936 opened the ski resort at Sun Valley, Idaho. Familiar with European precedents, Harriman believed the growing popularity of skiing could help the UP fill its trains, which like its competitors, experienced a dramatic drop in passenger traffic during the Great Depression.1 For those who could not afford travel to Europe, an American resort of equal charm could potentially fill a market need; it would also bring attention to areas served by the railroad. Harriman hired an Austrian count to scout Western locations suitable for his resort, eventually settling on a valley in the Sawtooth Mountains near Ketchum, Idaho, a small mining and sheep-herding town on the UP mainline. The railroad constructed a lodge, ski paths and even invented the modern chair lift to carry skiers to the top of the mountain.2 Soon after its inauguration, Sun Valley, in part due to its isolated location, became a favorite spot of Hollywood stars and other well-known figures. The Montrealer stopped near a dozen popular ski spots in Vermont and Quebec Province. Bilingual menus gave the Montrealer a cosmopolitan flair. By the 1950s, many of these special services faced increased competition from the automobile. Meanwhile, the sport of skiing grew exponentially as the “industry capitalized on new equipment developed, ranging from snow vehicles and ski clothing to improved boots and skis.”6 Post-World War II prosperity and increased leisure time gave Americans new opportunities to pursue sports and other activities. Amtrak, which took over the operation of most of the nation’s intercity passenger rail services on May 1, 1971, soon came to realize the potential marketing possibilities in promoting trains to skiers. Throughout the 1970s and 1980s, numerous articles appeared in magazines such as SKI and Skiing that compared Amtrak trains to the ski trains of yore. The writings reveal an intense interest in using passenger rail to reach ski spots and describe schedules, station stops, onboard accommodations and meal options. The train’s relaxed, convivial atmosphere is usually cited as a major reason for choosing rail. Early Amtrak brochures depicted skiing as a fun and youthful sport. 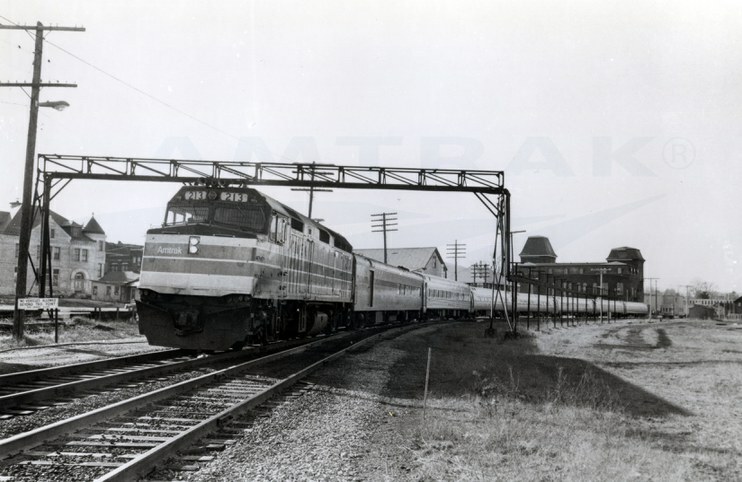 One of the first routes heavily promoted to this group was the Montrealer (northbound)/ Washingtonian (southbound) between Washington and Montreal.8 Although it passed through Vermont in the late evening and early morning hours, the train stopped at towns such as White River Junction, Montpelier and St. Albans that were in close proximity to major ski centers including Stowe, Bolton Valley, Jay Peak and Smuggler's Notch. The one catch was that making the short journey between the stations and resorts often required an expensive cab ride. Vermont was initially left out of the Amtrak system, as the last passenger rail service within its borders had ended in 1966. State leaders and advocacy groups mounted an effective campaign to revive rail service, finding success with the launch of the Montrealer/Washingtonian in late September, 1972. While Americans used the train to head to the snowy north, Canadians made connections at New York or Washington, D.C. for sunny Florida destinations. It gained a reputation for its cosmopolitan flair, with menus and other information printed in English and French. Travelling aboard the Montrealer, another reporter with Skiing magazine described “embellishments [that] include special handling for skis, and a bar car called Le Pub, plus a series of package plans put together with various areas and lodges…”11 The Tavern-Lounge Le Pub was a key attraction, known for its ambiance and piano player. Like many sports, skiing is a social activity that usually involves going out in groups. Thus, it made sense to provide travelers with a relaxing place to talk and enjoy themselves on the way to Vermont, or “après-ski” as they headed home. The popular Amtrak SKI PASS could be shared among friends. resorts in Utah, Colorado and New Mexico. 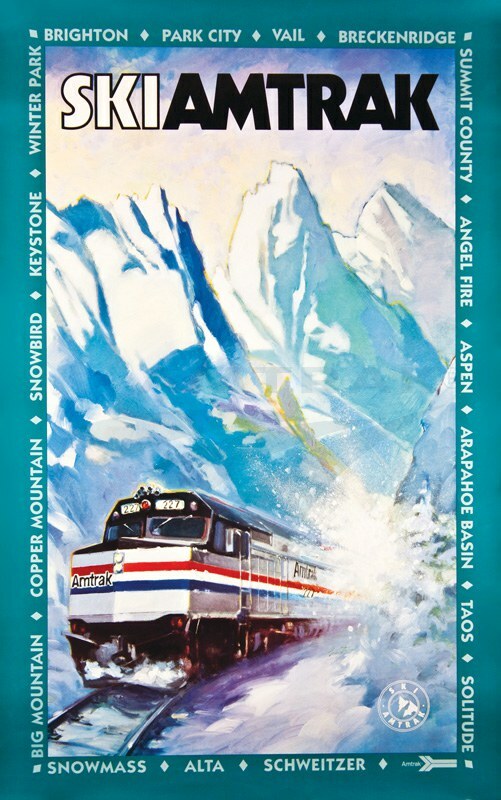 In the East, Amtrak promoted the Montrealer and Adirondack for Vermont, upstate New York and Canadian resorts, while out West, ski destinations such as Jackson Hole, Wyo. ; Park City, Utah; Big Mountain, Mont. ; Bogus Basin, Idaho; and Vail, Colo. could be found along the routes of the Empire Builder, North Coast Hiawatha, Coast Starlight, San Francisco Zephyr and the Pioneer. Passengers could also buy a SKI PASS, good from November to April, that entitled the holder to eight coach trips to a "ski resort station" for the price of six—a 25 percent discount. Even better, the pass could be shared among friends. If interested in upgrading to a Sleeping car or Amclub car, or a Metroliner Service train, reservations could be made at the station one hour prior to scheduled departure. Today, Amtrak remains a popular mode of transportation for ski enthusiasts. Passengers may make their own arrangements, or take advantage of a regional rail tour package. Amtrak works with long-time tour partners and western ski resorts to assemble vacation packages that appeal to all budgets and travelers. The Empire Builder takes passengers directly to Whitefish, Mont. for skiing at Big Mountain, while Winter Park, Colo. is a busy winter stop along the route of the California Zephyr. From the latter’s stops at Denver and Glenwood Springs, car rentals allow easy access to Copper Mountain, Breckenridge, Aspen, Snowmass, Sunlight Mountain and Powderhorn. This winter, Amtrak tracked the adventures of a team of free skiers that ventured to western Montana via the rails to experience the trip of a lifetime. Check out their story on the Amtrak Blog. Have you taken Amtrak to the slopes? Do you remember Le Pub? Share your memories in the comments section below! 1 Julie Berry, "Sun Valley’s Elite Beginnings: European Influence on the American Ski Industry" (Masters Thesis, Colorado State University, 2011). 3 Hank Barlow, “The ‘Golden Age’ of Ski Trains,” Skiing, October 1984. 6 Charles R. Goeldner and Stacy Standley, “Skiing Trends” (paper included in the Proceedings of the National Outdoor Recreation Trends Symposium, 1980). 8 After 1974, the train was simply known as the Montrealer for its south- and northbound runs. 9 Robert Shafer, “Amtrak’s Rookie Season,” SKI, October 1973. 10 Steve Brayton, “Focus: The Return of the Montrealer,” Passenger Train Journal, March 1973. 11 Dinah B. Witchel, “Ski Trains Are Back-Sorta,” Skiing, January 1974. 12 Alice Van Buren, “Moonlight on the Rails” Skiing, November 1982.